Wanting to sleep in my own bed (I normally camp at the trailhead) I got a late start, hiking ~7:30 a.m., but figured with the long days it wasn't a problem. Scott Paul trail still has a lot of snow on it, but I just booted to the ridge. Met a couple skiing down mid day who said the Roman Wall had been icy for them. A bit of a breeze and moderate temps made for perfect skinning. I met up with Mike & Ryan at the crater then drafted their excellent skin track up the Roman Wall (thanks boys!). They tagged the true summit while I rested on the west side. We dropped in ~ 3:30 and found good conditions up top, but turning mushy half way down the wall. Still quite skiable though all the way down - never too grabby. Some runnels starting to appear, esp. below Craig View, but the soft conditions helped tame them. We found a sweet gully to ski down from the ridge to within 100 ft. of the Trail, lumpy bumpy, but better than walking. Home around 8 for a hot tub, then fish tacos with my wife finished off a great day. Great meeting you, Jim. And thanks again for the great pics and video - and sharing that gulley with us! A great day indeed. We also got tacos - Taqueria Los Jarritos in Mt. Vernon on the way back to Seattle. 5 stars after a day of instant oatmeal and energy bars. Always a treat to connect with great people in great places. Thank you Jim for helping pioneer the routes, community, and culture that put 3 like-minded guys with skis on top of a volcano in the middle of summer. Very happy we got to ski with a "legend" as Chuck put it. Thanks for the report Jim. I think it may have inspired Greg who shot off an email suggesting a Saturday (7/8) ski. I thought my skis were all hung up to dry... but I was wrong. Sun-cups will probably continue to grow, but were really easy to slice through on this particular day, even for a 13 yr old. Only saw 2 other skiers all day (!). I'm sure Sunday was quite different judging by activity in the parking lot. 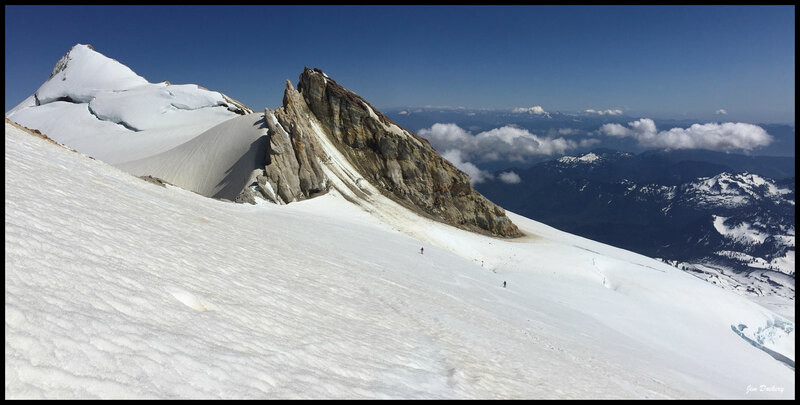 Great to do another ski with Greg with whom we did Glacier Peak last June (P's first volcano). I literally stop at this place every time I come back on 20. Heading up 20 - Jorge's Kitchen in Mt Vernon. If anyone has any better Mexican food options up North, do tell. Always hungry. Thanks for the great reports guys! Has anyone been up there in the last week or so? Looking for beta for August turns! Photo upload still is not enabled for July TRs. Great, thanks Charlie. Heading up tomorrow to take a peek at conditions.